Dinokeng Game Reserve is located just north of Pretoria, next to the N1 motorway by Hammenskraal. The reserve was struggling with four elephant bulls that broke fences. These elephant bulls had been breaking fences since they arrived in the reserve in 2013. However, after the fence-breakages had escalated, a young elephant bull named Peter Pan had been shot by a neighboring farmer in October 2016, and another young elephant bull named Tiny Tim had been involved in an accident on the N1, ERP was asked to assist the reserve in monitoring the elephants. ERP was contacted by Dinokeng Game Reserve to assist them with their “problem” elephants and to assist in mitigating the human-elephant conflicts the reserve was experiencing. ERP monitored the elephants from January 2017 to February 2018. The elephant monitoring was carried out with the help of satellite collars and a monitoring app. The satellite collars were set to update every 30 minutes. 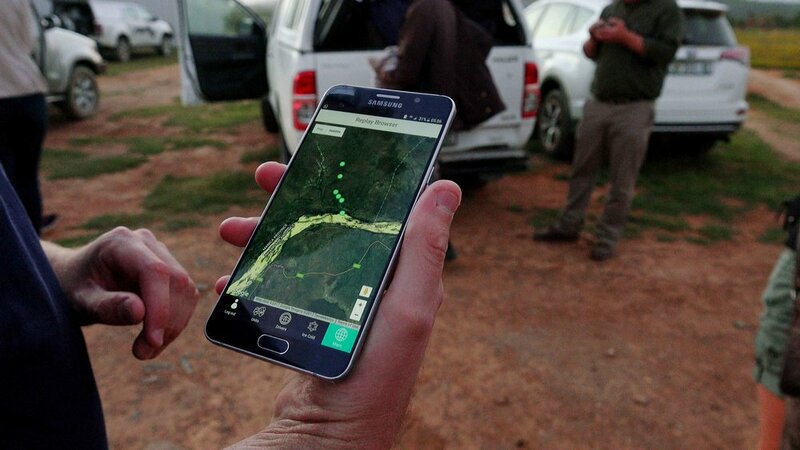 With the help of the app, it was possible to monitor them remotely and only respond if the elephants were moving closer to a fence or an area of potential danger for the elephants and for people. ERP deployed a full-time elephant monitor, as well as relief monitors to observe the elephants and prevent them from breaking fences. ERP funded three collaring sessions with satellite collars. The ERP elephant monitor was supposed to monitor the elephant bulls from 06:00 in the morning to 18:00 in the evening. At the request of the reserve, this became a 24-hour job instead. The ERP elephant monitor set up geofences along all the perimeter fences, as well as fences to island properties within the reserve (properties that were not part of Dinokeng Game Reserve). ERP set up a system so that the reserve management would receive an SMS whenever the elephant bulls entered a geofence. However, due to the large number of geofences on the reserve, the reserve requested that this system was abandoned and instead have the ERP elephant monitor be the alert system. The ERP elephant monitor set up a monitoring schedule with two teams – an ERP team that would monitor the app and a response team consisting of reserve staff. The ERP elephant monitor visited any property and/or fence, where the elephants had broken through to collect data to investigate and determine causes for breakage, e.g. design of fence, electrification or not, presence of attraction near the fence, take photographs etc. Reports on these were written and sent to both ERP and reserve management. The ERP elephant monitor checked up on the elephants’ health, e.g. wounds, cuts, injuries etc. that the elephants experienced. The ERP elephant monitor compiled an identification kit with photos, drawings of distinctive ear notches, marks and tusks, as well as all relevant information regarding family relations, major events in the elephants’ lives, contraception etc. The ERP elephant monitor compiled a management report based on the framework in the norms and standards and providing the reserve with in-depth summary on relevant elephant topics and held this up against the situation at Dinokeng. The ERP elephant monitors compiled a report on the reserve’s fences and gates to provide the reserve with an overview of the state of their fences and gates. In the 6 months, one of the primary ERP elephant monitors worked 1,505.4 hours, 335.9 hours of these responding to the elephants near fences, and prevented 90 fence-breakages (equivalent to 42 % of fence-breaks if ERP had not been present). Due to ERP’s data collection, it was possible to determine a trend in the fence-breakages, as 85 % of the properties that were broken into had some sort of attractant to elephants, i.e. water, animal feed, palatable vegetation etc. After Dinokeng Game Reserve requested that monitors carried firearms after dark and requested a security company to do this, ERP funded Secrete Eye to do this monitoring. Translocated two of the four elephant bulls to Zinave National Park in Mozambique. The ERP elephant monitor kept written records of all encounters, reports, incidents, the times responding to elephants near fences etc. At Dinokeng Game Reserve, ERP did everything within their power to monitor the elephants and prevent them from breaking through fences. Dinokeng Game Reserve could have had potential in becoming a reserve suitable for elephants. However, due to lack of management experience, being understaffed, dwindling engagement and action from the reserve’s side, internal politics in the reserve, and the perceived power of individual landowners it eventually became impossible for ERP to conduct the interventions that were required.